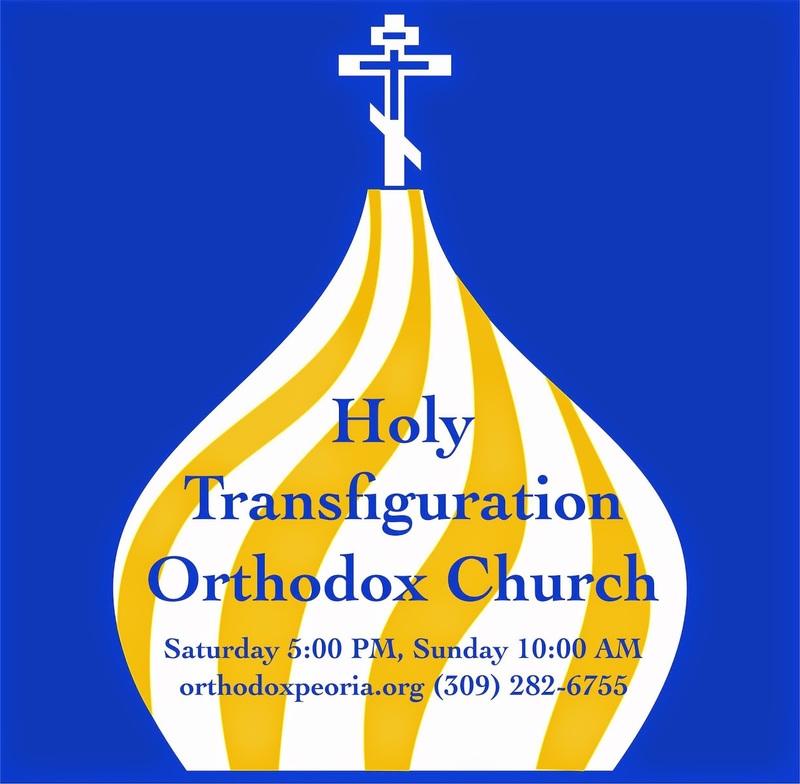 Starting in January, we will have the opportunity for more frequent services with a priest at Holy Transfiguration. We have already updated our calendar for the next several weeks to reflect our ambitions. We have also added a new "Online Donations" link on the right side of this page. Please make use of it as we will need the extra funds to support Fr. Gabriel as he travels back-and-forth from Indianapolis to serve in Peoria. Without additional income we will not be able to have Fr. Gabriel here as often as he will be available. 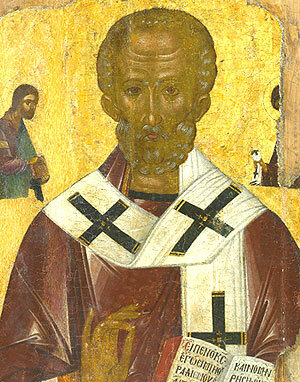 St Nicholas was born (c. 270) in the the region of Lycia (southern Asia Minor), in the city of Patara. His parents, Theophanes and Nonna, were both pious Christians, and being childless until his arrival, consecrated Nicholas to God at his birth (the name Nicholas meaning 'Conqueror of nations'). His birth considered by both an answer to their prayer, and especially the prayer issued during Nonna's illness, his mother was said to have been healed immediately after giving birth. Nicholas would always remember his parents' love and devotion to God, and in his later years promised to come to the aid of those who remembered them in their prayers. Various traditions recount signs of Nicholas' future glory as 'wonderworker' (Gr. thaumatourgos), apparent already in his earliest childhood. One recalls that as an infant in the baptismal font, Nicholas stood on his feet for three hours in honour of the Trinity. Another proclaims him a childhood faster, not accepting milk from his mother until after the conclusion of evening prayers on Wednesdays and Fridays. His later life revealed that Nicholas had from a young age been absorbed in the study of the Church's sacred scriptures. He thrived on reading divine texts, and earned a reputation as a devoted youth who often would not leave the church, reading the sacred texts late into the night. 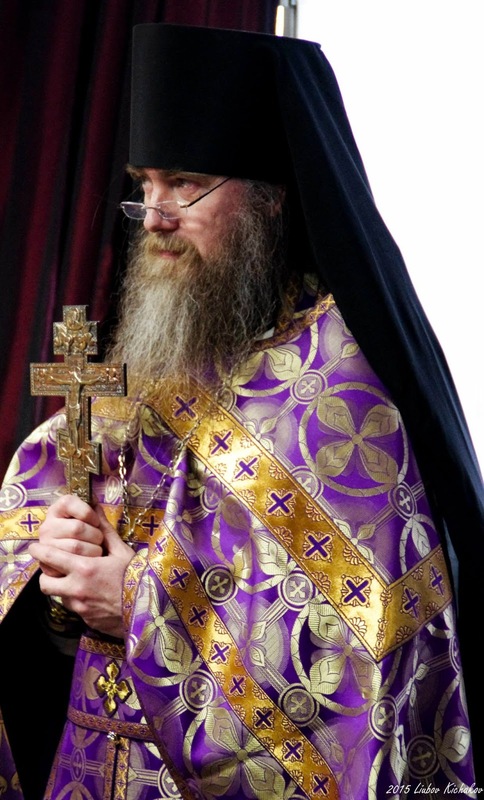 The newly-ordained Fr Nicholas' special charge as assistant to the bishop of Patara was the instruction of the faithful—a unique and uncommon role, given his young age. Beloved in Christ archpastors, all-honourable presbyters and deacons, pious monks and nuns, dear brothers and sisters! 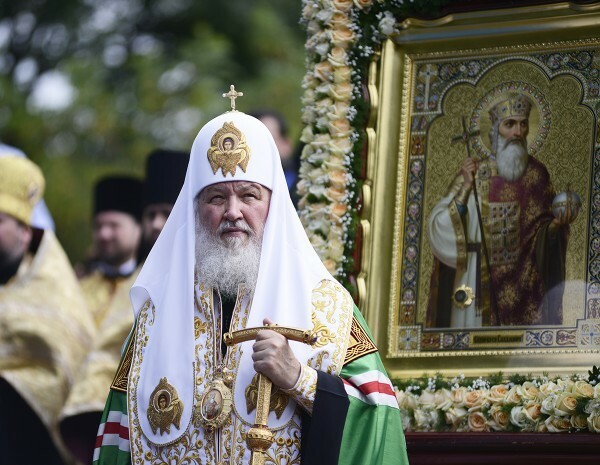 This year the whole Church of Russia and together with her the entire Orthodox world are marking the millennium of the demise of the Holy Prince Vladimir Equal-to-the-Apostles. What has this man brought us? Why after many centuries we commemorate him so solemnly? The essence of the prince’s feat is remarkably expressed by St. Hilarion in his famous Homily on the Law and Grace: ‘All the countries and cities and peoples honour and glorify each their own teacher who has taught them Orthodox faith. Let us too, as much as we can, praise the one who did a great and wonderful thing, our teacher and leader Vladimir, the Great Prince of our land’. His wise choice changed the whole course of our history, for he brought us the good news of Christ the Saviour of the world – the unfading Sun of the Truth that illuminated the human existence with His divine light. Thanks to St. Vladimir, our people found themselves under the protection of the Intercessor swift to hearken – the Most Holy Virgin and Mother of God who spreads her honourable omophorion over our land. Thanks to this holy ruler, the Church of Russia was founded, which brings to people for over one thousand years now the word of life, love and peace and in which we, just as our forefathers, find the Heavenly Kingdom. By embracing the faith from the Eastern Roman Empire, Byzantium, Rus’ came to fully share both the Divine Revelation and the greatest cultural tradition of the time, creatively taking in and developing it. 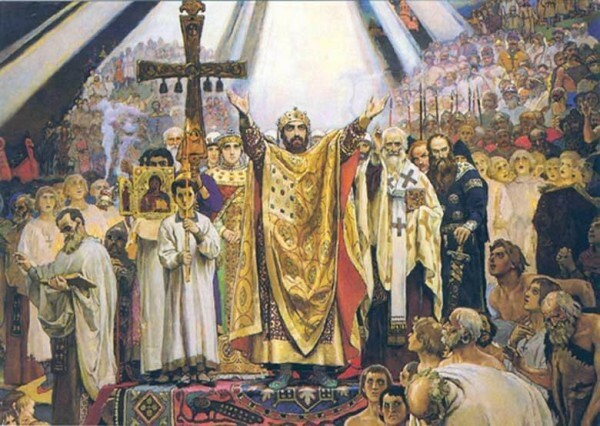 Like the Equal-to-the-Apostles Emperor Constantine, Prince Vladimir was not afraid of defying the views of his armed force and boyars – the ruling class of Old Rus’, who associated the heathen worship with power, wealth and fertility. He was not afraid either of the wrath of the crowd instigated by heathen priests to make bloody sacrifices. Like Moses who heard the call of God: Bring My people out of Egypt (Ex. 3:10), Prince Vladimir brought Rus’ out of the pagan captivity and put her on the bright path of confessing Christ as God and Saviour. This man equal to the Apostles became one of those who symbolize the Orthodox ideal of righteous power guided by true values, directing the individual and society to God and to life according to His commandments. As we know, the Baptizer of Rus’ was concerned not only for the devotion of the newly-enlightened people but also for their education and help to the needy. St. Hilarion, praising the Prince of Kiev, says, ‘It was not one man or ten men or a city, but this whole land that he turned away from the falsehood of idolatry’. These words were uttered as far back as the 11th century when the wonder of the Baptism of Rus’ happened not long ago. It was followed by ten centuries of our Christian history. During this time the Lord revealed a multitude of saints in our people and our culture and civilization was formed. And all this is what we live by today. Our very worldview is founded on the fateful decision made by Prince Vladimir to turn to true God and make the people follow him. The Dniester baptismal font initiated a new, Holy, Rus’, and our spiritual unity. For the centuries that elapsed since that time, attempts were made to eliminate Orthodoxy, to sow discord and civic tribulation among our peoples, to lure people by false ideas and promises of early temporal happiness and material prosperity. However, by the Lord’s grace, Holy Rus’ lives in our hearts to this day, for our peoples to this day have one faith and one Church, common shrines, countless models of Christian feat and a common history. Today again we are experiencing a difficult time when senseless people seek to divide us, to deprive us of peace and accord by sowing enmity and hatred among brothers. These people, on the basis of momentary moods and egoistic aspirations, make dangerous decisions having long-term and sometimes even indelible consequences. But wise people understand that their life and good works can become a part of God’s design for the salvation of the world. That is why they always keep eternity in mind and look mentally to history, learning lessons from it and finding answers in it to the most important problems of today. We all need to look for these answers, overcoming the negative information noise produced by the mass media. And we can find them also in the examples of great personalities who made a beneficial influence on the development of our people and who are canonized by the Church. Prince Vladimir Equal-to-the-Apostles is one of them as he laid the saving faith of Christ in the foundation of the life of the peoples in historical Rus’. May the Merciful Lord the Lover of Mankind, through the intercession of St. Vladimir, help us to stand steadfast in Orthodoxy, guarding ourselves, just as His apostles did, by purity, by knowledge, by longsuffering, by kindness, by the Holy Spirit, by sincere love (2 Cor. 6:6). Amen. 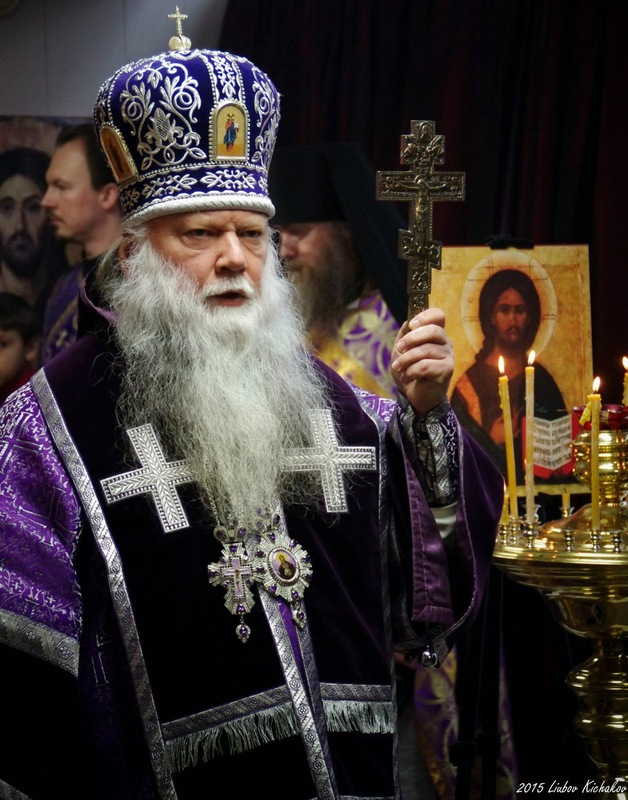 On the fifth Sunday of Great Lent 2015, commemorating our holy mother St. Mary of Egypt, Holy Transfiguration Orthodox Church were blessed to host Bishop Peter, Pastoral Vicar of the Diocese of Chicago and Mid-America, for both his first visit to Peoria and the first-ever archpastoral visit to Peoria by a bishop of the Russian Orthodox Church. Vladyka was attended by Protodeacon Alexander, his wife Liuba, and their children. 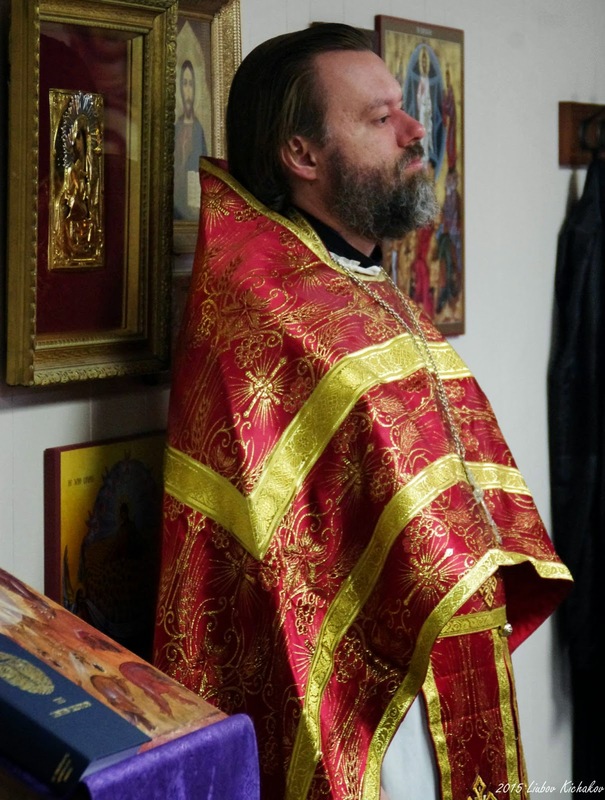 Also serving were parish rector Hieromonk Alexander (Reichert) and Priest Joseph Towne. Although our space is small Vladyka's own words spoken to me years before rang true again, "Where there is love, there is always enough room." 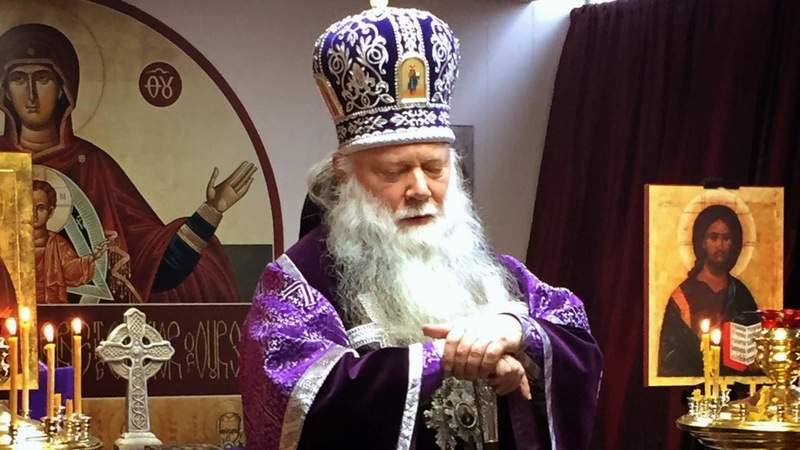 After the Divine Liturgy, the parish hosted everyone in attendance for lunch at a local establishment, and then to coffee before receiving final blessings from Vladyka prior to his return to Des Plaines. We are thankful to God for being counted worthy of this historic moment not only for our diocese of the Russian Church, but also for our local community. The joy of our celebration together still lingers here. More photos are available via our Facebook page. across the face of the entire earth! Today the Holy Church represents Bethlehem in each of Her temples. She desires that each heart be a pure manger for God… What is necessary for this? It is necessary for each of us to become a child. From His manger the Lord proclaims: look at Me, the Creator of the world, I have become a child for your sake. If you do not change and do not become like children, you will not enter the Kingdom of Heaven (Matt. 18:3); you will not be capable of and worthy of receiving Me into your hearts. Let us humbly beseech the God Child that He grant our people spiritual strength for the overcoming of fraternal strife, that through the prayers of the right-believing, equal to the apostles Great Prince Vladimir peace be restored in the God-preserved lands of Rus’, having been cleansed through repentant tears as through a second baptism. May we uphold the way of St. Vladimir which alone can save us and our historic native land, and with it the entire world. And then the promise of the luminary John (Maximovitch), the great archpastor of the Russian diaspora, will come to pass: “Blessed are you, the land of Russia, which is being purified by the fire of suffering! 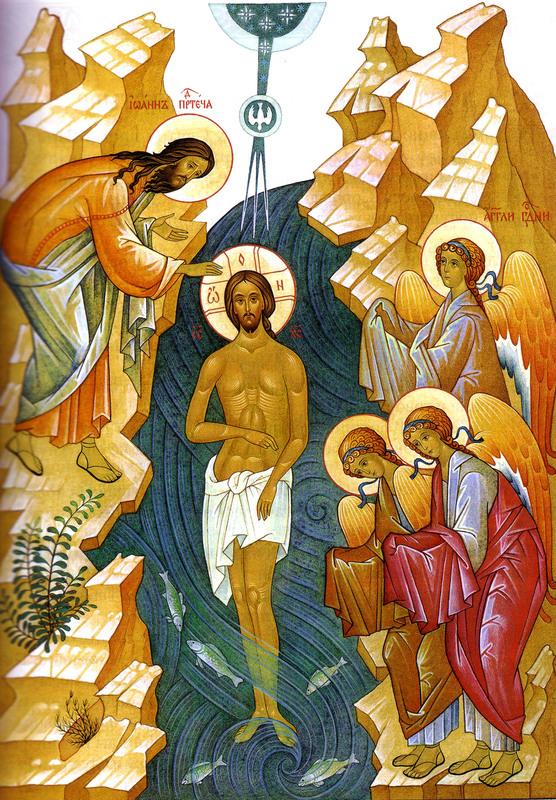 You passed through the waters of baptism, and now through the fire of suffering, and will enter into your rest” (from his Homily on the 950th Anniversary of the Baptism of Rus’, 1938). Once again I greet all the beloved children of the Russian Church Abroad with the joyous and world-saving Feast of the Nativity of Christ! Through this greeting, I would like to underline the spiritual loftiness of this good and luminous celebration. May the Son of God enlighten our hearts with the quiet light of the star of Bethlehem. To Him is due glory and thanksgiving unto the ages of ages. Amen! Your Graces the archpastors, venerable fathers, all-honourable monks and nuns, dear brothers and sisters! On this holy night I address all of you living in different countries, cities and villages, yet making up the One Russian Orthodox Church, and from the bottom of my heart I congratulate you on the world-saving feast of the Nativity of Christ. I send you my heartfelt greetings, my dear ones, and prayerfully wish that we all be filled with spiritual joy in participating in this great festivity and enjoy the banquet of faith as sons and daughters of God and friends of Christ (Jn 15:15). Today, as we contemplate the mystery of the incarnation of God, we strive to understand what the meaning of this event is that happened two thousand years ago in Bethlehem and what relationship it has to us and our contemporaries. St. Paul writes: ‘ But when the fullness of the time was come, God sent forth his Son, made of a woman, made under the law, to redeem them that were under the law, that we might receive the adoption of sons’ (Gal 4:4-5). But what preceded this fullness of time? The entire history of the human race before the Nativity of Christ in essence is the history of the search for God when the best minds tried to understand who is the source of the supernatural power which affects every human person in one way or another in life. On their path for searching for God, people, in endeavouring to find the truth, have stumbled into all sorts of errors. Yet, neither man’s primitive fear before terrifying natural phenomena, nor the deification of the natural elements, idols and at times himself, nor even those rare insights which illumined the pagan philosophers, have brought people to God. And when ‘the world by wisdom knew not God’ (1 Cor 1:21), he deigned to come down to people. With our spiritual eyes we contemplate the ‘great mystery of godliness': the Creator is likened to creation, he assumes human nature, endures humiliation, dies on the cross and rises again. All of this transcends human understanding and is a miracle which reveals the fullness of the Revelation of God of himself to people. Christ is born and the world has found hope, Christ is born and love reigns forever, Christ is born and the heavens have bowed down to the earth, Christ is born and the star of Bethlehem shows the true way to God, Christ is born and let no one believe in the triumph of evil, for we are ‘saved through faith; and that not of yourselves: it is the gift of God’ (Eph 2:8). The prophet Isaiah awaited and foresaw the coming of the Messiah, and exclaimed: ‘God is with us’ (Is 8:10). His divinely inspired words are even today a source of ineffable joy for millions of Christians. Once born in Bethlehem, the Lord is born in our hearts and abides with us if we remain faithful to him and the Church that he has founded. He is with us when we accomplish good deeds. He is with us when we help our neighbours. He is with us when we are compassionate and sympathetic. He is with us when we reconcile enemies. He is with us when we forgive and remember not evil. He is with us when we pray and participate in the Church’s sacraments, more so in the sacrament of Thanksgiving, the Eucharist. The feast of the Nativity of Christ speaks to us of that which is most important; we are called to learn how to love God and serve him, our Saviour, the one who has granted this salvation to all nations and for all times, who extends his embrace to each one of us. In acquiring the skill of worshipping God and reverentially standing in his presence, we at the same time learn how to serve our neighbour as well by manifesting ‘faith which worketh by love’ (Gal 5:6). We have only to add a little – to respond to the action of the saving grace of God through our obedience, through our trust in the words of the Lord, through our desire to fulfill his commandments. If we master this great truth, then much will be transformed not only within ourselves but around us. We will be able to set priorities on our values, we can peacefully, calmly and assuredly go along the path of life mapped out for us, rendering praise and thanksgiving to God. In order to attain this spiritual state, we must be Orthodox people not only by opinion polls but according to our deepest convictions and way of life, as our pious ancestors were ardent believers and people who loved God. Among these a special place is occupied by the baptizer of Rus, the Holy and Equal-to-the-Apostles Grand Prince Vladimir, the thousandth anniversary of whose demise we shall commemorate this year. It is thanks to him that we are the bearers of the lofty estate of Christian and in total comprise the single family of Orthodox brotherly peoples of historical Rus. Thus it was, is and shall be. And no temporary troubles and trials, no external forces can tear asunder these centuries-old spiritual and cultural ties of the inheritors of the baptismal font of Kiev. In these holy days of the Nativity the prayers of the fullness of the Church and my own fervent prayer are for peace in the country of Ukraine. 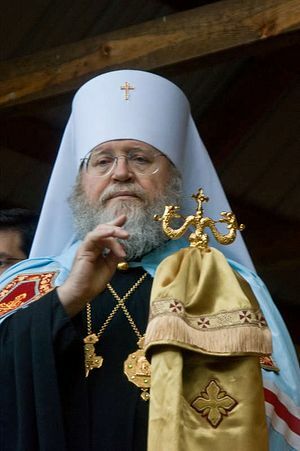 Irrespective of where her children live and of their political views and preferences, the Russian Orthodox Church fulfills her responsible mission which was placed upon her by Christ (Mt 5:9). She has done and continues to do all that is possible to reconcile people and help them overcome the consequences of enmity. At the bottom of all conflict, hatred and division is sin. According to St. Justin Popović, sin ‘exploits all its power to accomplish one thing: to render the human person godless and inhuman’ (St. Justin Popović, Philosophical Abysses). And we see in what infernal state the human person at times abides when he has lost the dignity granted to him by the Creator. Yet the Church in the name of God, tirelessly proclaiming to people the ‘great joy’ (Lk 2:10) of the birth of the Saviour, calls upon each dweller on earth to believe and transform himself for the better. She offers to us the way of ascent: from seeking out God to the knowledge of God, from the knowledge of God to communion with God, and from communion with God to becoming like God. St. Athanasius the Great, who lived in Alexandria in the fourth century, expressed the purpose of the coming into the world of the Saviour in these amazing words: ‘God became man so that man may become god,’ yet not according to his nature but according to divine grace. The centuries-old experience of the Church testifies that genuine transfiguration, theosis, is accomplished through the action of grace by means of the voluntary co-operation between God and the human person. And it is attained through labour, in obedience to the Creator, and not through accepting the diabolic temptation of the serpent who intimated to our ancestors that they should taste of the fruit of the tree of the knowledge of good and evil and immediately become ‘as gods’ (Gen. 3:5). Every person who lives according to faith knows that it is fidelity to God that deters him from evil deeds and thoughts, that it is faith which inspires him to spiritual feats and labours to the glory of God and for the good of our neighbours. In congratulating you all on the great feast of the Nativity of Christ and the New Year I would like to wish you from the bottom of my heart good health, peace, prosperity and abundant succour from on high in following our Lord and Saviour without stumbling.